Though awash in the deep shadows of late evening, my face is aglow with the reflected light of a single, hearty flame rooted in the concrete before me. The flame bends and writhes in the breeze which channels between the massive stone columns to my right and my left. I am entranced, a cobra's prey, mesmerized by a dangerous waltz. This is the Tomb of the Unknown Soldier, dedicated to the nameless French patriots who died in World War I. It burns directly beneath, l'Arc du Triomphe, the Paris memorial to all its veterans, especially those who fought in the Napoleanic Wars in the early part of the 19th century. I appreciate these symbols and I appreciate this light. We took the Metro to the Franklin D. Roosevelt station which let us out onto the Champs-Élysées, that fabled avenue of restaurants and shops which I've heard about in movies and books all my life. The street breaks at a very famous traffic circle which skirts l'Arc du Triomph. At night, hundreds of pairs of headlights sweep across the four sides of monument, banking to the right and becoming lost in a river of red and white. This dazzling whirlpool of electric color is most dramatic from above and, thankfully, our Paris Museum Pass allowed us to ascend the spiral staircase concealed in one of the columns. Inside, there is a very small set of exhibits about L'Arc du Triomphe and its conception, construction, and symbolism. But the real reason for our climb was through another dim corridor, dank with the sweat and odor of the hundreds of tourists who make this climb every day. Up a few more stairs and out into the warm night air we realized our goal. After dark, every hour on the hour, la Tour Eiffel is set sparkling with white lights. Of course, it remains brightly lit all night long, a beacon of gold, a guardian, a herald. But at each hour, someone flips a magic switch. Though there are technically no tripods allowed at the top of the Arc, we found a way around that prohibition by bringing our little "gorilla pod," an all-terrain tri-pod with flexible, prehensile limbs. It was small enough not to arouse suspicion, and it allowed us to get some wonderful low light shots of this glorious city. Paris stretches beyond the line of sight from any vantage point. During the day, its size, when seen from above is intimidating, overwhelming, too much. But at night, it is a veritable sea of lights, all colors, shimmering like a dream. On Sunday, we visited the Tour Eiffel. It was our first stop and, though jet lagged, we were beyond excited to see it. Coming from the North, we exited the Metro station and walked to the École Militaire, a complex of beautiful old buildings which once served as a military school. But it's hard to pay attention to such things when, on your right, you witness the rise of the majestic Tour Eiffel, all 324 meters of iron screeching for the heavens. It is a peaceful approach to the Tour Eiffel from there, along a pathway flanked with green lawns and clusters of mature, leafy trees. People picnic and play Frisbee on the grass, lay out in the sun, read books, and pose for silly pictures with the tower in the background. We walked to it with our mouths agape, too tired to speak about what we saw, but definitely awestruck in tandem. Then we were standing beneath the yawning iron grid of the Tour Eiffel and overwhelmed by many things... seeing this massive emblem of Paris after so many years of anticipation... preparing to ascend to the second tier of the tower on foot.... the unexpected summer heat... and the crowds of people. So many people! They were milling about like confused ants between the four pillars, queuing to enter the stairs, queuing for the elevators. Throngs of people, every race, creed, color, age, size, shape, religion represented, babbling in a chaos of tongues. Thirsty, I headed for a concessions cart. An open palm interrupted my path like the wide-open face of the moon. Please stop. Her fingers were slender and pale. Her headscarf had loosened around her shoulders and was fading back from her forehead exposing an unruly hairline and gold hoop earrings. "Speak English?" she asked. Surprised, we nodded automatically. Then she thrust a card out and up for us to read. Please help. I and my family having no money. "Sorry," said Jon, and took my elbow to lead me firmly past this dark waif of a girl, to pull me from the tractor beam of her disturbingly downcast eyes. "I'm sorry," I said over my shoulder. But she was gone and on to another pair of tourists, no time for my sympathies. Pity cannot buy food. We waited in line for tickets to the top of the tower and it felt like we were in Disneyland, snaking slowly between a carefully placed maze of railings and guideposts. It was a long wait, mostly in the sun at that time of day. But eventually we had our tickets and we entered the turnstiles. We walked up hundreds of steps to the first tier, then strolled around all the edges to take in the vast view before hiking up to the second tier to do the same. Because of its open construction, it is possible to continue enjoying the view as one ascends, a mercy considering the length of the climb. At each of the switchbacks are displays about the history of the tower and Mr. Eiffel himself, both in French and English, to act as a further diversion from the burn of one's thighs and soreness of one's feet. Arriving on each level is absolutely worth the effort. Major city sights can be located easily with the naked eye, but there are helpfully labeled photos and maps scattered around, too. Sacré-Cœur. The brilliant gold dome of the Panthéon. Saint-Chapelle. Notre Dame Cathédral. La Defense. The Seine. 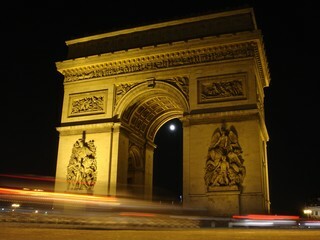 L'Arc du Triomphe. On the second tier of the tower, there is a room with a giant window pane of reddish-pink glass. I couldn't figure out what the room was for, and we didn't stay there long as it was soon time to hop aboard the elevator to la sommet (the summit) of the tower. But the next evening, peering out over the edge of L'Arc to Triomphe, a warm summer nighttime breeze caressing my face, my arms wrapped around the slender waist of my husband... I had a revelation... La Vie en Rose ! In the film Sabrina (1952), Audrey Hepburn is Sabrina Fairchild, the lovelorn chauffeur's daughter who would prefer death to living without the unwitting apple of her eye, the handsome, roguish David Larrabee(played pitch-perfect by William Holden at the height of his "golden boy" phase), the youngest son of the wealthy family for whom Sabrina's father works. But Sabrina's suicide attempt is thwarted by older Larraby brother, Linus (some would say Humphrey Bogart is too old for this role, but I find his gravelly voice and dismissive air towards all but Sabrina herself utterly inherent to his character). Sabrina is sent to a famous Paris culinary academy to learn to be a chef so as to secure her own employment in the future, but what she learns in Paris is far more essential than that. When her metamorphosis from coltish, girlish caterpillar to elegant, stylish butterfly is complete, thanks to the cocoon of culture provided by Paris, Sabrina returns home prepared to live for love rather than to die for it. Very few scenes in the film are supposed to take place in Paris, but in one, Sabrina is penning a letter to her father. Outside the window of her room, someone is playing an accordion with loving dexterity, and the song heard by the audience is La Vie en Rose, a famous French tune. The title means Life in Pink and refers to one who "sees the world through rose colored glasses." It follows Sabrina through the rest of the film. At one point, she even sings it to Linus, the man who eventually earns her heart. The lyrics of that song are what I felt atop l'Arc du Triomphe on that Monday night. I see life in pink. And it makes me something. Paris has been christened many things... City of Light. City of Love. It's monuments are recognized throughout the world. But those beautiful names, however true, are easily extended to this city by those who have only seen it from vantage points high above. They are broad sweeping generalizations tinted rose. Standing before the open flame dedicated to the memory of an unknown soldier and his patriotism, I am aware that my brief glimpse of Paris has only allowed me to scratch its iridescent surface. I am one girl, fragile and armed with only a pocketful of French verbs and nouns, with barely a decent grasp on conjugation, and I am humbled by my helplessness. Luckily, Paris is generous with her own beauty. Bienvenue , she calls. Enjoy me! Knowing the depth of the blood rivers which ran through my revolutions, knowing the hefty thunk of Madame Guillotine, knowing Hugo and Descartes, Lautrec and Monet... none of these will make you enjoy the power and uniqueness of my Tour Eiffel or my Arc du Triomphe more than you do now. You can climb the stairs and see Paris through rose colored glass and love it exactly like that. Rest assured, Paris is for everyone. Paris est pour tout le monde! And so I can say this as a proud tourist... 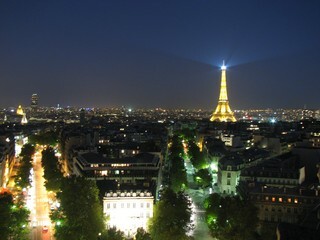 I love the lights of Paris. I love her monuments, her cafés, and her Metro. And I will visit her again someday. Photos from Europe 2009 - France can be found at our gallery . Elle aime parler français en France!